Your smile is very important to the team at North Hill Denture Clinic in Calgary, AB. 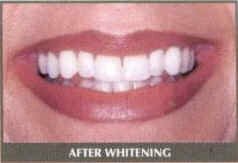 We realize that often the final difference between a good smile and a great smile is the whiteness of your teeth. Consistently drinking coffee, tea, dark soda, and red wine or smoking can contribute to staining your teeth over time, even with good oral hygiene and regular dental exams. If you notice that your smile isn’t looking as bright and fresh as you want it to, ask us about our new whitening agents to remove the stains without harming your teeth. Why choose professional whitening over an at-home kit? Whitening your teeth is one of the easiest things that can be done to brighten up your smile and improve your appearance. While you can get over-the-counter whitening kits, they’re rarely as effective as professional whitening procedures. Because over-the-counter trays are not custom fitted by a professional and the whitening agent may leak out and irritate your gums, the kits do not work as quickly or effectively to whiten your teeth. To get a brilliant, camera-ready smile, we have two easy and safe options available. Restore your smile to its natural luster with the Sapphire Whitening System. 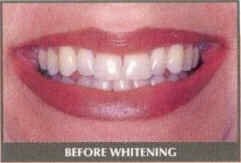 The Sapphire Whitening System has been clinically proven to whiten teeth up to 12 shades in just one hour or over seven shades in a single 30-minute treatment. It’s safe for use on most patients, and their Sapphire Desensitizing Shield is specifically formulated to prevent the whitening sensitivity that’s common with at-home kits. The process relies on a hydrogen peroxide-based bleaching gel that lightens discolorations in the tooth enamel and dentin layers. When our dental team applies the gel to your teeth, the Sapphire Desensitizing Shield minimizes the chances of feeling any bleach-related tooth sensitivity. To maximize your results after treatment and to keep your new smile pearly white, you’ll receive a take-home gel from the Sapphire Whitening System for touch-ups. To maintain your brilliant smile, we recommend following good oral hygiene practices by brushing and flossing every day and avoiding dark-colored foods and beverages as much as possible. The second option available at North Hill Denture Clinic is a professional-grade take-home whitening system called Poladay or Polanight. Poladay uses a neutral pH hydrogen peroxide gel formula to lighten and lift stains, with varying strengths available based on your desired results. Polanight, on the other hand, works while you sleep using a carbamide peroxide and fluoride solution combined with Pola Desensitizing Technology to gently whiten teeth without discomfort or sensitivity. Before you begin the whitening process, you’ll come to our office for a consultation and receive a custom-fitted dental tray that’s worn like a mouth guard. When you’re ready to whiten your teeth, you’ll use a plastic syringe injector to line the mouth guard trays with whitening gel. Place the trays over your teeth for one to two hours per day, and you’ll be well on your way to a brilliant smile! Our office recommends retouching your teeth with a whitening procedure every six to 12 months, since food and drink will slowly start to create new stains. Our patients love the results, and side effects are minimal during these safe procedures. If you do experience any tooth sensitivity, discontinue use of the whitening gel right away and contact our office for alternative teeth whitening options. Children under 13 and pregnant women should wait to pursue teeth whitening. If you aren’t sure which method will help you achieve the white smile you want, schedule an exam at North Hill Denture Clinic today. We’ll discuss your desired results, timeline, teeth and gum health, and diet to make a personalized treatment recommendation here in our Calgary, AB, denture office. Schedule a teeth whitening treatment today at (403) 282-6126!